Scrambling routes are often based on the old Bedouin trails on the mountains. They are mostly hill walking routes but you should be prepared to use your hands occasionally to help you along. They take you into parts of the area that most tourists never see : they are for the adventurous people who enjoy a challenge. They are more difficult than the hiking routes, and you will need to be in good physical condition to get a maximum of enjoyment from them. Do not try a difficult trip unless you have previous experience in scrambling! There are plenty of "easy scrambling" routes around, and we should be happy to discuss your preferences when you arrive here. If in any doubt, go for an "easy" day, which can be followed by a more difficult one if you are happy with our mountains. We offer here mainly one and two day tours, and also a five day trip but they can easily be extended, either by adding on all or part of another programme, or by taking a few other routes not described here. 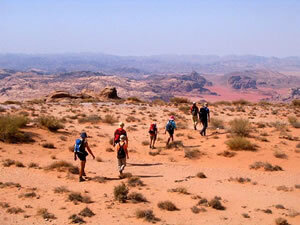 We can also provide a more varied week in Wadi Rum by combining the hiking trips with the simpler scrambling. 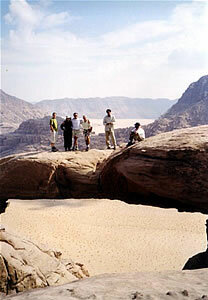 Many groups coming from tourist agencies much appreciate our week long trekking tours in Wadi Rum. Footwear : These trails are more "interesting" than the hiking routes and hiking boots with cotton socks are definitely recommended. Stout hiking sandals can also be worn; on some routes trainers are a possibility. Consult your guide if in doubt. Other equipment : You are likely to be in the sun for much of the time and should have a head covering of some sort - this is the time to learn how to tie a Bedouin kefiya! You will also need a rucksack or shoulder bag for water, and such oddments as your camera, sunscreen, a light sweater according to season and perhaps some biscuits for a snack. Chocolate melts quickly, but the guide willl show his devotion to duty in helping you to eat it. Burdah Arch is deservedly one of the best known and the most spectacular sites in Wadi Rum. It is situated about 300meters above the sand and the views from it are magnificent. We include it in a number of our scrambling tours, but this time we are also offering it as an addition to our normal jeep tour. You will lose a bit of the jeep tour, granted, but very little. After lunch we proceed to Jebel Burdah and climb to the Arch. We come in from the back, and cross a rocky plateau (see the top left hand photo which can be enlarged) before reaching the Arch itself. The climb is not a hike - you will need to use your hands over the rocks and you will be happier if you have a fairly good head for heights, but it is straightforward with no real need for a rope. 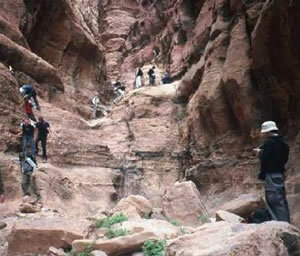 Any adult who is reasonably fit can do this climb, but it is not suitable for children under 16 years old (please see the page on Wadi Rum for children). The climb and the descent normally take about 3 to 4 hours. The continuation to the summit of the mountain is much more difficult and is not included in this trip. When we come down we shall usually return to the camp for supper, since it will probably be close to sunset. In the summer, if we have time we can call quickly at the Um Fruth Bridge, but I think you will find it rather dull after Burdah! Footwear : Obviously boots are better here, but they are not essential. Good walking shoes with cotton socks will do quite well. Other equipment :You will also need a rucksack or shoulder bag for water, and such oddments as your camera, sunscreen, a light sweater according to season and perhaps some biscuits for a snack. We have put together a programme which avoids most of the crowds here in Wadi Rum and which takes you far from the usual tourist routes. It is a four day programme, but deliberately designed so that you can choose do do just three, two or even only one day if you do not have the time for all of it. We warn you that you might have difficulty in deciding which day or days you would like! It is a hiking and easy scrambling progamme that shows you some spectacular views. You do need to be in reasonable physical condition, but it is neither difficult nor too demanding. The day consists of something adventurous in the morning and an easier trek in the afternoon, usually after a rest midday. You will walk or scramble between four and six hours total in one day. Hiking boots and cotton socks are always preferable for this kind of programme, but you can perfectly well manage with trekking sandals or even trainers. We shall sleep every night in our camp. Day One : We head off straight away to the Rakebat Canyon through the massif of Jebel Um Ishrin. The beginning involves scrambling up a big slab, before descending steeply into a narrow ravine – this is “Goat Gully”. When we come out from here, you will realise just how much of a labyrinth exists inside the imposing mountain. Canyons start off in every direction, and you need either a sharp eye for terrain or a good guide with you. The sandstone walls are very impressive, towering above you. After lunch in Wadi Um Ishrin, we have an easy hike to the Barragh Canyon. The Barragh canyon leads between magnificent cliffs, with high sand dunes heaped up against them. These cliffs are the site of many world class climbing routes, and perhaps a team will be climbing here. Day Two : The next day, we make our way to Jebel Burdah and a climb to the famous Arch. This is easy scrambling, but as in the Rakebat Canyon, the guide will have a rope with him for safety, and the climb should provide no difficulty for active scramblers. Although Jebel Burdah is not very far from Rum Village, the view from the Arch is among the finest to be seen in the whole of the Wadi Rum area. To go up and down again usually takes about 4 or 5 hours. In the afternoon we hike towards the "Middle Arch" of Um Fruth. This is very simple climbing compared to the Burdah Arch. Day Three : We drive south to the Khasch Ridge. This is a long ridge stretching from east to west across the desert. There is no particular difficulty about this walk, although perhaps you might need to use hands to go up and to come down again at the end. We shall take a picnic lunch with us and stop somewhere to eat. Be sure to cover up against the sun here, there is little shade around, but the views to the north over Wadi Rum and to the south towards Saudi Arabia are magnificent. In the afternoon we shall do a shorter hike. Day Four : The views are even better. We are heading to Jebel Um Adaami, the highest mountain in Jordan, right on the Saudi border. This is a difficult drive for the 4x4, but as passengers you should enjoy it, especially the wide and lonely Wadi Saabit in the far south.When we reach the mountain we shall start up through a gully: this is the only difficulty in the ascent. The rest of the path is a stony one, leading to the cairn marking the summit. Here we are right on the border and can see far into the Saudi mountains. Make sure you have plenty of film with you! Like all tours lasting more than one day, this trip will end at about 4pm on the last day when we bring you back to Rum Village. Price : for 2-3 people 75JD per person for one day, 70JD/person for more than one day. This includes all meals and sleeping equipment.